I have a thing for dogs. The live fluffy kind, of course, but also the statuesque kind. China dogs . . .
Celluloid dogs . 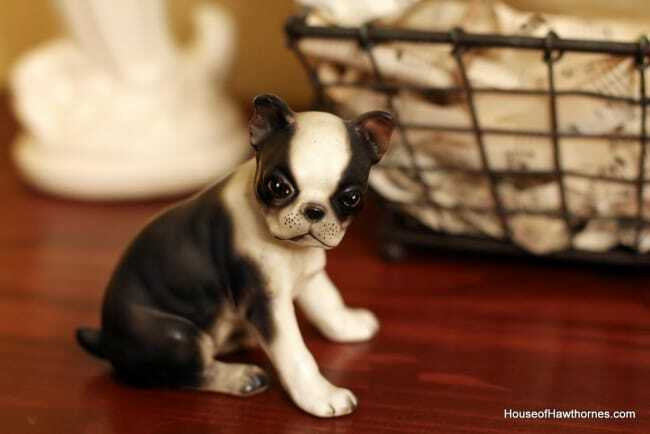 . .
Toy dogs (I think this is Tramp, from Lady And The Tramp) . . . Dogs permanently mounted to ash trays . . . Even dogs that have been beheaded and made into bottle openers . . .
And apparently, I am not the only person addicted to dog things. 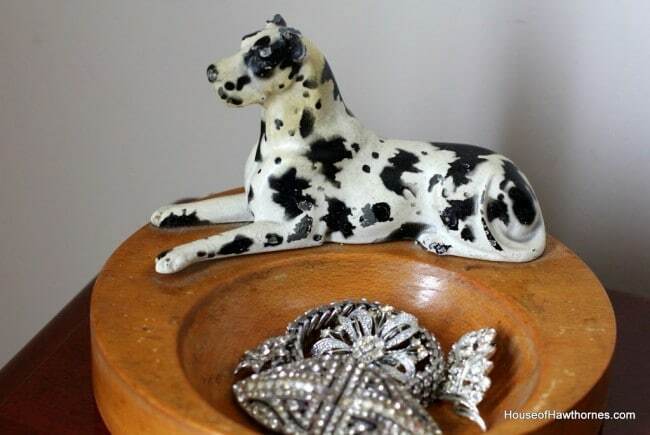 In the spring issue of Flea Market Style magazine, dogs was one of the top ten collecting finds this year. Can you believe that!!! 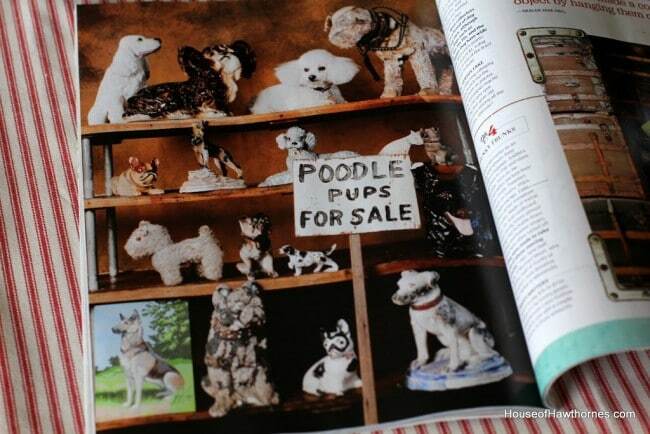 BTW, I went to an estate sale today and they were selling quite a few dog figurines. For $15 a piece! Are you kidding me? Seemed a little steep, but maybe they had just read Flea Market Style magazine too and thought there might be a run on the dogs. Have you caught the dog collecting bug? I love my doggie pieces! I started collecting little china doggies when I was about 10 and I am still doing it! Love the older pieces! 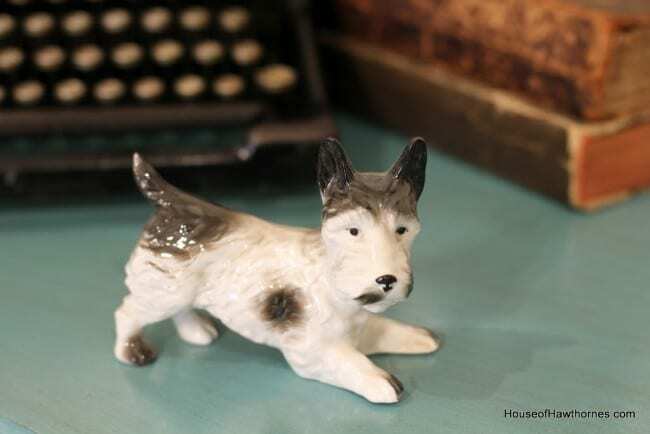 I just got a set of salt and pepper shakers that look like our (Corgi Mix) Winston! LOVE all of your sweet finds! When my Nana died, she left me a collection of dogs…which my mom got rid of. I wonder if that is why I love to collect now? Anyway, as I was cooking dinner, I was wondering how many things I like to collect as I was drying a cutting board that I need to sand down before using. I am partial to any animal figurines but especially cats, elephants, rabbits, birds, cows, frogs, fish…you get the picture. Oh, and dogs too, if they’re cute. Love the boxer, he’s a beauty. Hi Pam, you have a great collection. they are getting harder and harder to find. Love how you have them styled, what a great straw suitcase!! thanks for joining in on the party! So, do you recommend that I behead my dog and turn her into a bottle opener? It’s probably important that you get back to me soon! Love them! But, oh no for me. You’ve put ideas in my collecting head. I’m more of a cat person, but I LOVE your collection!!! The collie is my favorite! My friend has a collection of dogs, but your has that cute Boston Terrier that I love. Love your collection and your blog. Ok, I’m going to try and reply again…and not call you by the wrong name, PAM!! 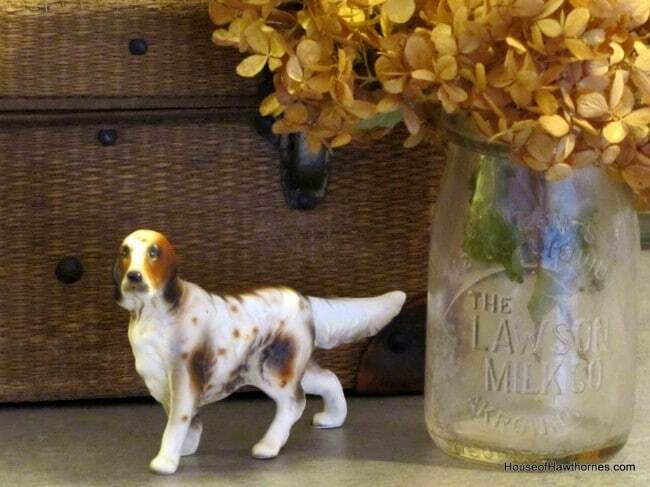 I LOVE dog collectibles, too…this post is pure eye candy! I love your collection! And I’m glad you staged that one photo LOL you make me want to start a collection. 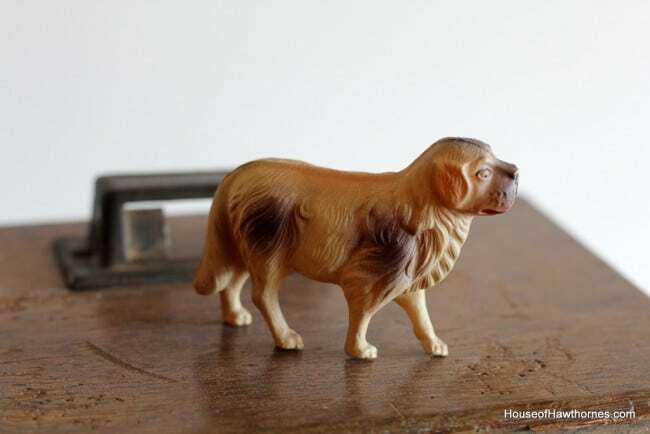 I don’t collect all dogs, but we’ve had cockers in our family since we got married so I have only vintage cocker figurines. Love your set though ! I do not collect that, but doesn’t mean I won’t sooner or later. You are so cutting edge! Love all of your doggies. I used to have little cats that my mom got me when I was in grade school. Have no idea where they went to. 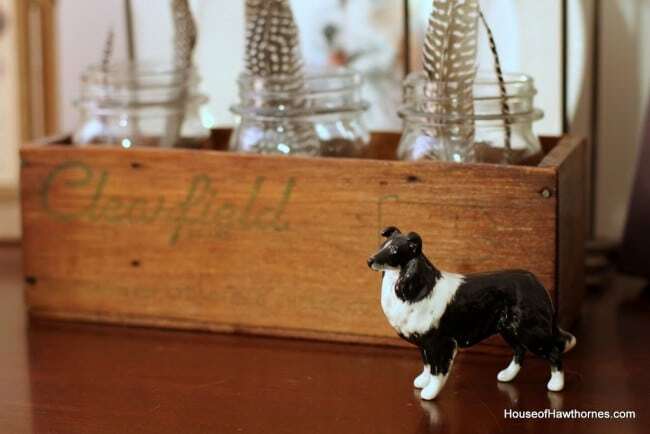 When I ran the antique mall- there were several who wanted the little scottie dogs. Couldn’t keep them very long at all. Big seller. I love all things dog! But so does my daughter, so they usually find their way to her house. You’ve got some darling dogs in your collection. What a fabulous collection. I especially love your staged rhinestone jewelry and toy “tramp” dog. You totally crack me up. 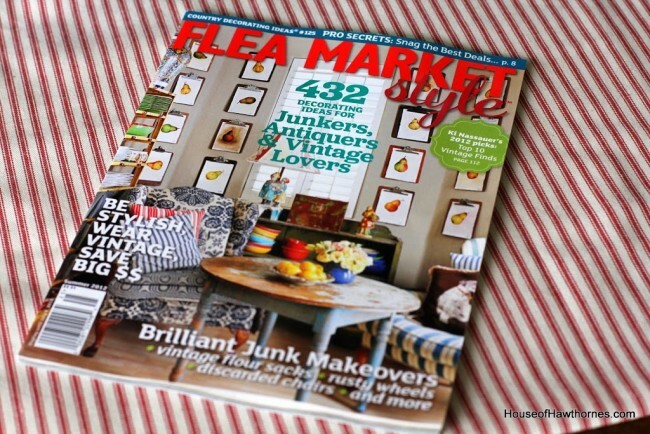 Thanks for the tip on the latest issue of flea market style. I didn’t realize it was out. Looks like I need an excuse to hit the grocery store tomorrow. Love your dog collection. 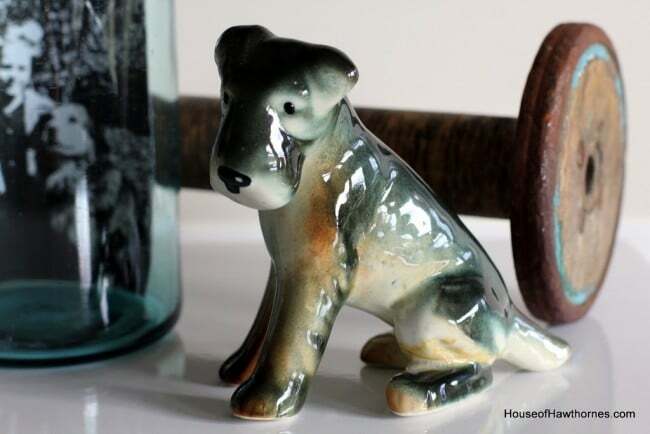 I have a very small collection of dog figurines….all wire hair fox terriers…..just like my own little fur ball! All cute little dogs and I loved the way you have photographed them. I have a few that are from the fairs and carnivals of the 50’s and early 60’s. I should dig them out of the memories box (many totes) and put them out. I’m jealous – no sales here yet 🙁 I’ve still got to get my copy of Flea Market Style for spring, but I fear it will having me yearning even more for spring and sales. 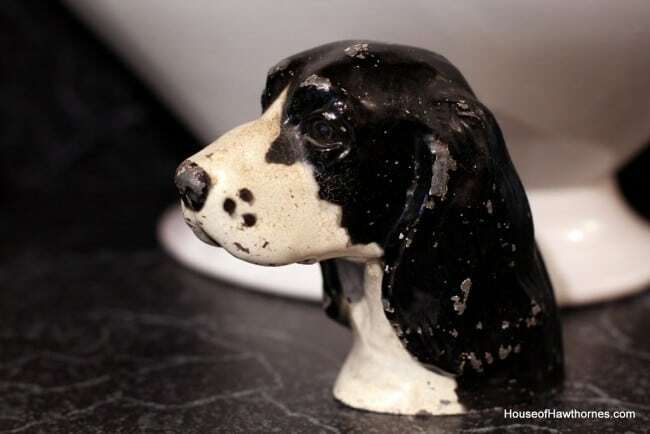 Yes, I have been collecting dog stuff for years: ceramic dogs, linens embroidered with dogs, dog pictures, etc. I would love to collect real dogs too, but I have to wait until I have a job before I can adopt a dog or two (or three or . . .) I love dogs! Love your dog collection! 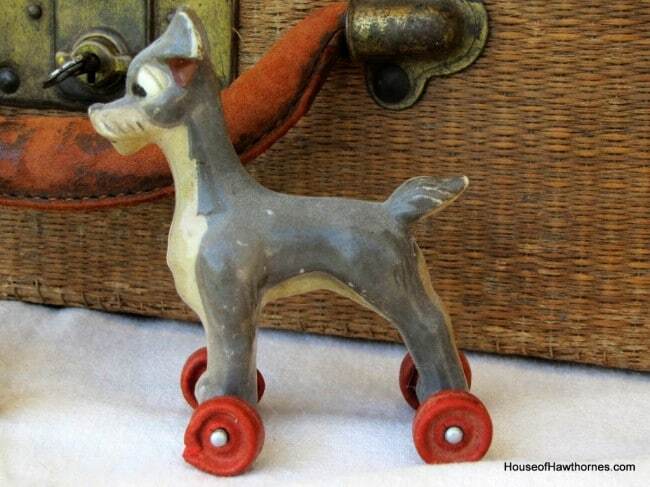 I especially like the dog on wheels!!! He’s just adorable! I do have one…I expanded on hubbys collection. You have the same one his mother had, the springer spaniel or some kind of setter. Anyway I love them and have them on a shelf in the tv room. I love the little boxer pup of yours. What a FANTASTIC collection. The dogs were just precious. Who knew collecting them would be trending in 2012? Definitely a GOOD investment for the future.And the fact you love each and every one, PRICELESS. ENJOY. Take care. No dogs for me…I’m kind of a boring decorator. That’s a great collection you have. I’m partial to the one that looks like a schnauzer, since it makes my think of my dog, Murphy. of course your on the cutting edge! I love your pups. When I was little we use to go on trips and I collected a few myself. Isn’t it funny how something we love all of a sudden becomes the hottest thing going?? I love these dogs! Cutting-edge Pam hasnt’ this happen to you before with something you liked to collect? Some tin thing or something i remember? I love those dogs but have never been able to find ones! Now that they are the “in” thing, perhaps I will see more! Your collection is great! You have quite a collection of dogs…the Boston reminds me of the one we used to have…RIP Dude! OMG!!! Stupid me. Why didn’t I stop by sooner? Today, I stopped by a thrift shop in a different town. They had dogs!!! Many… oh, so many. Are you looking for any more in particular? your little dog collection is so cute. i love china dogs too! Me too. I love dogs. I have had four little friends in my life. Three have gone now. Stella my current rescue. She is an eight year old frenchie. Love her. Then currently at the Good Will I have picked up pictures and statues of my little friends. You have the cutest collection eva Pam! They are super adorable. My daughter and one of my best friends both collect dogs, so I’ve let them be the Queens of Doggie Collections in my life. Good luck with the BlogHer ads. I can’t seem to stay on a regular blog update schedule to even consider something like that, although I’d like to. You spoke the truth when you said it takes time and resources. I saw that too. I have a collection of dogs too. But I know I didn’t pay that much for any of them. Except maybe the real, warm fuzzy ones, haha. Just found your blog and really enjoy reading your comments and the pix. dogs are my favorites but at this point only have grand dogs which we are called upon to “babysit” often!